In this lecture, given in Hamburg, Germany on Janmastami day on September 4, 1969, Prabhupada stresses how important it is to use our senses to serve Krishna in order to be able to understand anything about Him. IMPORTANT NOTE: The entire transcription of this lecture follows below the audio players—so, read along! This is a verse from Vishnu Purana. It is stated there that vishnu-shaktih para, "The energy of the Supreme Lord is spiritual." Energy and the energetic, they are nondifferent. Just like the sunshine is the energy of the sun globe, but the quality of sunshine and the sun globe is the same. It is not different. The sunshine is bright, illuminating, hot—similarly, we can understand the sun globe, the temperature may be very high, but the quality is the same. God has got one energy. That energy is spiritual energy. And kshetrajnakhya tatha para: and the same energy is manifested in another form, which is called kshetrajna, or marginal energy, or the energy in which we living creatures are acting. avidya-karma-samjna, and tåtiya shaktir ishyate. And besides these energies, there is another energy, which is avidya , ignorance. Karma-samjna : and it is based on fruitive activities. Anya means besides these two energies, spiritual energy and the marginal energy, living entities, there is another energy, which is called avidya. Avidya means ignorance. And karma-samjna : and in that energy, one has to enjoy his, the fruit of his own labor. This material world is also energy of Krishna, or God, but here ignorance prevails. Ignorance is prominent. Avidya , ignorance. Therefore one has to work. Practically one hasn't got to work, but because he is, one is in avidya , ignorance, therefore he has to work. So actually, there is one energy: spiritual energy. Krishna, or God, is the whole spirit, and the energies emanating from Him, that is also spiritual. In the Vedic language we understand that the shaktiman , or the energetic, Krishna, and the energy, they are nondifferent. So this material energy is also nondifferent from Krishna. Sarvam means all, idam , this manifestation, this cosmic manifestation, whatever you are experiencing... Krishna says that "I am expanded as this cosmic manifestation." Maya tatam idam sarvam. . .avyakta-murtina. "Everything is resting on Me, or everything is expansion of Myself." "But I am not there." This philosophy, acintya-bhedabheda— simultaneously one and different—is our philosophy, inaugurated by Sri Caitanya Mahaprabhu, although it is in the Vedanta-sutras. So everything is simultaneously one and different from the Supreme Lord. But there are two classes of philosophers. One class says that God and the living entities are different, and there is another philosopher, monist philosopher. They say God and the living entities are one. So this acintya-bhedabheda philosophy adjusts that "God and the living creatures, they are simultaneously one and different." They are one in quality, just like the energy and the energetic, the sun globe and the sunshine. In quality, in sunshine there is heat, there is illumination, light. In the sun globe also, there is heat, there is illumination. But the degrees are quite different. You can bear the heat and illumination of the sunshine, but you cannot go to the sun globe or you can bear the heat and temperature there. The scientist says that so many millions miles away, if somebody goes or some planet goes near the sun globe, it will immediately burn into ashes. Similarly, God and ourself, Krishna and living entities, they are qualitatively one, but quantitatively, we are very minute. Anu . We are smaller than the atom. Nowadays there is atomic theory. We can see the atoms within the holes of the windows when there is focus of sunlight. That is called prasarenu. Prasarenu means six atoms combined together, then it is visible. Otherwise, atom is also not visible with our naked eyes. There is atomic theory, paramanuvada , in Vedic literature also. And Bhagavata says that the scientists may be one day able to count how many atoms are there within this universe. This is not possible, of course, but it is theoretically. The Vedic—Srimad-Bhagavatam—says that "It may be possible one day by scientific research, one can count how many atoms are there within this cosmic manifestation. Still, it is not possible to know the Supreme Personality of Godhead by our ordinary sense perception." Atah Sri-Krishna-namadi na bhaved grahyam indriyaih [Cc. Madhya 17.136]. Krishna, or God, is not perceivable by your material senses. It is not possible. Atah , therefore, Sri-Krishna-namadi. Atah Sri-Krishna-namadi. Namadi. Namadi means "beginning from His name." Because we try to understand Krishna beginning by chanting His holy name, Hare Krishna. So either His name or His form or His quality or His paraphernalia or His activities—none of these can be understood by your material senses. It is not possible. Indriyaih , the senses. Then how it is understood? Sevonmukhe hi jihvadau svayam eva sphuraty adah. When we take to the transcendental loving service of the Lord, then the Lord reveals Himself. We cannot understand. He reveals Himself. Therefore, sevonmukhe hi jihvadau. Jihva means tongue. The first business of is to engage the tongue in the service of the Lord. How you can engage the tongue in the service of the Lord? By chanting and glorifying His name, fame, quality, form, paraphernalia, pastimes. This is the business of the tongue. When the tongue is engaged, gradually all other senses are also engaged in the service of the Lord. The tongue is the most important sense within our body; therefore for controlling our senses it is recommended that one should control first of all the tongue. ta'ra madhye jihva ati lobhamaya sudurmati. Our present conditional state is like this. We are packed up in the network of this material body. It is just like a fish is caught within a net. Similarly, we are caught up by this network of this material body. Not only this body—we are changing this net in various phases of life. There are 8,400,000's of holes of this network. This is a network of ignorance, avidya-jal. Avidya means ignorance. Sarira avidya-jal jatendriya tahe kal. And this network, my imprisonment within this network of ignorance, is being continued on account of these dangerous senses. Sense enjoyment. So out of these dangerous senses, Bhaktivinoda Thakura says, the tongue is the most dangerous. Tongue is the most dangerous. The tongue... If we cannot control the tongue, then the tongue will oblige me to take different types of body, one after another. If I am very much fond of satisfying my tongue by flesh and blood, then nature, material nature, will give me facility to taste flesh and blood fresh and give me a body of the tiger. If I do not discriminate of eating, then material nature will give me a body just like a hog, when we have to accept, as our food, stool. So we are so-called materially suffering and enjoying according to this body. Therefore this body, this human form of body, is a great opportunity, because God realization begins by engaging the tongue. Sevonmukhe hi jihvadau [Brs. 1.2.234]. By engaging the tongue in the loving service of the Lord, one can make advance(ment) in Krishna consciousness, ultimate realization of God, the tongue. So this tongue, in the human body, can be engaged. In other body, in the cat's body, dog's body, tiger's body—tiger may be a very powerful animal—(but) no animal is powerful or better than human beings. That is accepted. So this human form of life is a great boon to the living entity who is traveling through the cycle of birth and death, perpetually changing different sorts of body. Here is the opportunity, human form of body. We can utilize the tongue properly and get out of these clutches. So seva, seva means service; jihva adau , beginning from the tongue. So if we can keep our tongue engaged, always chanting Hare Krishna mantra ... Because "Krishna," this sound, is not different from Krishna. Krishna is absolute. Nothing is different from Him. Krishna and Krishna's name is not different. In the material sense, everything is different. I myself (am) different from this body. I am not this body. But Krishna is not like that. Krishna and Krishna's body is the same. Avajananti mam mudha manusim tanum ashritah [Bg. 9.11]. Krishna says in the Bhagavad-gita, "Rascals and fools, they deride (at) Me because I appear as a human being. They are thinking just like ‘I am ordinary human being’." Param bhavam ajananto — "These rascals do not know what is My influence and what I am." Param bhavam — "What is My nature they do not know. Without knowing Me, they consider, 'Krishna is an ordinary human being.' "
Avajananti mudha —This very particular word has been used, mudha. Mudha means rascals. So in spite of this warning, there are so many rascals passing as big scholars. They say like this—“when there is order of Krishna that ‘you surrender unto Me,’ (the rascals comment), it is not to Krishna but the unborn spirit which is within Krishna." He does not know that Krishna is not different from His body, Krishna is not different from His name, Krishna is not different from His fame. Anything pertaining to Krishna is Krishna. They are monists, they are philosophizing that oneness, but as soon as they come to Krishna, immediately they divide: "Krishna is different from His body," or "Krishna's body is different from Krishna." So atah Sri-Krishna-namadi . So Krishna's name and Krishna is not different. Therefore, as soon as my tongue touches the holy name of Krishna, that means immediately it associates with Krishna. So if you constantly keep yourself associated with Krishna by chanting this mantra, Hare Krishna, then just imagine how you are being easily purified simply by this process, chanting— jihvadau —engaging the tongue in chanting. And your tongue wants very palatable dishes to taste. So Krishna is very kind. He has given you hundreds and thousands of palatable dishes, remnants of foodstuff eaten by Him. You eat. In this way, if you simply make it a determination that "I shall not allow my tongue to taste anything which is not offered to Krishna, and I shall engage my tongue always chanting Hare Krishna," then all perfection is within your hold. Two simple things: Don't eat anything which is not offered to Krishna. That's all. Our Krishna prasadam are so variegated, nice varieties... The variety is the mother of enjoyment. How much enjoyment you want with your tongue? You can have simply by eating Krishna prasadam . And the more your tongue is purified, the more you relish the chanting of Hare Krishna mantra . Anandambudhi-vardhanam . It is stated by Lord Caitanya Mahaprabhu that it increases the ocean of bliss, transcendental bliss. Ocean does not increase—we have no experience within this material world. If (the) ocean would have increased, then all the lands would have been swallowed up many long, long years ago. Ocean does not increase. But this ocean, transcendental bliss, is increasing. Some of you must have experienced, those who are actually relishing. The authorities like Rupa Gosvami, he says that "What I shall chant with one tongue? If I would have millions of tongues, then I could chant a little more. And what I shall hear with two ears?" So he's expecting, he's aspiring to have millions of ears and trillions of tongues to relish this chanting Hare Krishna. So that is another stage, of course, when this chanting will be so melodious that we shall try to have more ears and more tongues to utilize it. By our present senses, we cannot understand what is Krishna, or what is God, what is His name, what is His form, what is His quality. Therefore immediately, if we try to understand Krishna by His picture, "Oh, Krishna is embracing Radharani or the gopis," we shall mistake. Because unless our senses are purified, we shall accept Krishna and Radharani as ordinary young boy or girl and their dealings. But actually it is not. It is pure. Caitanya-caritamrita has distinguished that the loving affairs of the gopis with Krishna and the ordinary—these lustful dealings of human beings— there is a gulf of difference. He compares that the gopis' love with Krishna is gold, and our so-called love here is iron. As there is difference between gold and iron, similarly there is difference between the loving affairs of gopis with Krishna and these mundane, so-called lusty affairs between men and women or boys and girls. 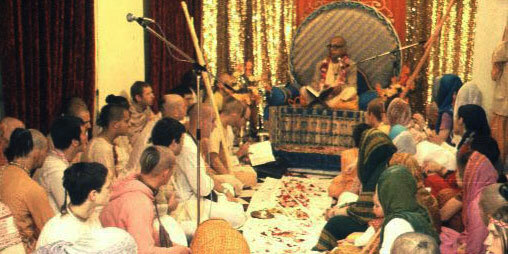 First of all, engage (in) chanting Hare Krishna.
. . . and there will be no more any material condition. That is the next stage. If you chant Hare Krishna mantra without any offense, then immediately the stage will be that you are freed from all material anxieties. That is the test—how I am advancing in chanting will be tested “how far you are free from material anxieties.” That's all. Ceto-darpana-marjanam bhava-maha-davagni-nirvapanam [Cc. Antya 20.12]. Prasannatma — Bhagavad-gita says, "When one is Brahman realized..." Brahman realized means one who understands that I am not this body. I am pure spirit soul, eternal servitor of Krishna. Simply understanding that "I am not this body. I am spirit soul," is not enough. That is not sufficient knowledge. Therefore those who are pure devotees, they are not disturbed even in most distressed condition of life. What they think? They think, tat te 'nukampa ...: "My Lord, it is Your great mercy that You have put me into this distressed condition:"
So in the distressed condition, the devotees take it an opportunity that "I have got a very nice opportunity to remember God constantly. Krishna, You are so kind that You have given me this distressed condition." Bhagavad-gita says if one is situated in Krishna consciousness, even in the terrible situation, fearful situation, he is not afraid. Just like Prahlada Maharaja. You see? Prahlada Maharaja, a five-years-old boy, his father tortured him like anything. But he was not afraid. He was not afraid. This is the Krishna consciousness state. The boy is not afraid. Even in such tortured condition, when his father challenged him, "Prahlada, with whose strength you are so powerful that you do not care for me?" he immediately answered, "My dear father, by whose power you are talking like that?" So Krishna consciousness is so nice that even one is put into the terrible condition of distress, he is not perturbed. There are many verses like that. We can quote hundreds. If one becomes Krishna conscious, he is not afraid, any condition of life. If he is put into the hell or in heaven or in the spiritual world or any world, he is happy. Tulyartha-darshinah —he thinks everything is all the same: "Either you put me in the hell or heaven or this or that, (it) is all the same." Because he is always with Krishna, chanting Hare Krishna. Krishna is always with him. So where is the cause of being afraid that "This place is not good; this place is very good?” No. Wherever Krishna is there is very good. That's all. So we have to practice and train the tongue very nicely. And the more our tongue is engaged in the loving service of Krishna... It is very nice service. You simply chant and eat Krishna prasadam. Is it very difficult service? Everyone will accept, "Oh, yes." But unfortunately, everyone does not accept. (laughter) (chuckles) You see. "Krishna is everywhere" means as soon as we accept, Krishna is immediately with us. And as soon as we reject, oh, He is far, far away. So Krishna can be with us very easily simply by this chanting or engaging the tongue in His service. So Caitanya Mahaprabhu recommended this process, or He inaugurated this process in this age. Although it is not new system, but He especially introduced because His incarnation is to reclaim the fallen souls of this age. So He... [break] ...before advent of Krishna he's simply planning, "As soon as Krishna will take birth, I will kill him." This is the plan of the demons, to kill God. Atheism. "God is dead"—that is also killing, one sort of killing. "There is no God. I am God." These are all different processes of trying to kill. But God is never killed. Rather, they are killed. That is the whole history everywhere. Guest: I don't follow. Is it...? Whose choice is it to be a demon? Is it the living entity's choice, complete choice, to be demonic, against God, or is it a part of Krishna's energy to put demons, or to have created him that way? Guest: Is it completely each individual's choice to be demonic, or...? Prabhupada: Yes. Demon means when he is forgotten, when has lost his sense, that is demon. When has lost his sense, that is demon. Demon means mayayapahrita-jnanah [Bg. 7.15]. Maya, by the influence of maya , the true aspect of knowledge is taken away. Anyone who is trying to establish it that "There is no God," he is demon. That's all. There are so many philosophers, so many atheists, so many scientists. Their only business is to deny God. They are demons. Yes? Guest: Then is there individual complete choice? Prabhupada: That is ignorance. Yes. Apahrita-jnanah means just like a madman. For the time being, his natural knowledge is taken away. Crazy. What do we mean by crazy? For the time being, his knowledge is taken away. Similarly, when a living entity is in that position, as somebody has taken away his knowledge, that is demonic condition. But he can be reestablished again in knowledge. Just like a crazy man is sent—mental disorder, to hospital for treatment; again he comes as a sane man. Similarly, the demons are just like crazy men. Even they are treated with Krishna consciousness, they can be reverted to their own position. So this is temporary. This demoniac nature is temporary due to the contact with maya . Therefore the whole business is how to get out of the clutches of maya . Then there is no more demonic nature. It is artificial...superficial. It comes and goes. As it comes artificially, so it can go also. And the driving method is this Krishna consciousness. Guest: So maya is temporary, and the only thing that is eternal is Krishna and the spiritual energies. Prabhupada: Yes. Spiritual energy. That is eternal. That is eternal. So we are... due to our ignorance, we have been very much serious with the temporary situation of maya and we have forgotten the eternal position. This is our present conditional life.